Both beautiful and practical, Aesop harnesses the finest botanical extracts and fuses them with the latest and greatest scientific discoveries for incredible results. For those who find traditional creams too heavy, or require an additional moisture boost in winter, this serum is the perfect solution. Providing light hydration, it dries with a matte finish and helps combat oiliness without astringency, so skin feels soothed, nourished and protected. A very little goes a long way and the aloe vera is calming and refreshing upon application, making this ideal for those in humid or urban environments who can't bear the weight of a more typical moisturiser. 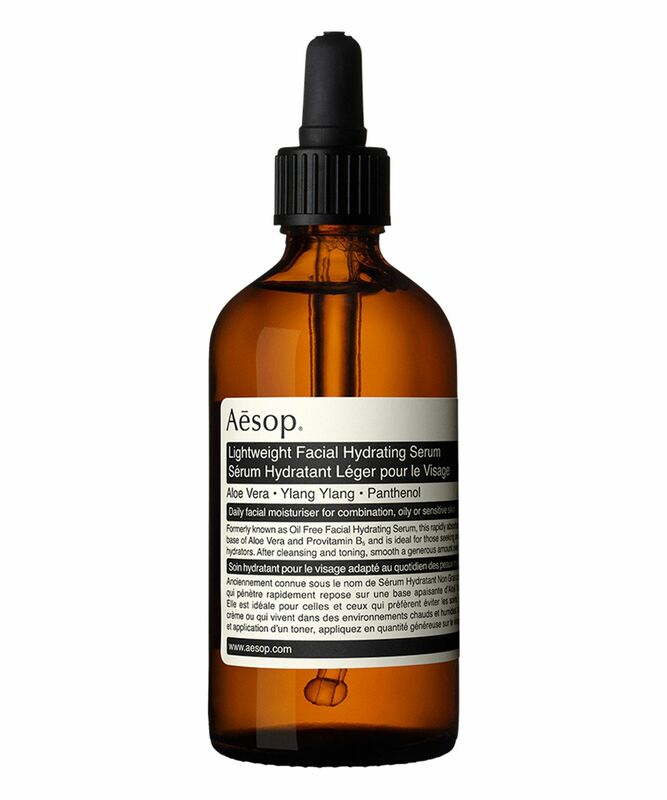 The ideal moisturiser for oily or combination skin, Aesop's lightweight Oil Free Facial Hydrating Serum applies smoothly and absorbs quickly, without clogging your pores. Aloe vera juice forms the base (hence the slightly sticky texture) but skin drinks up this serum in a matter of minutes, leaving a slightly matte finish that preps skin perfectly for make up. The aloe vera calms redness and soothes sensitivity, while the antioxidant properties of vitamins B and C protect skin from free radical damage. 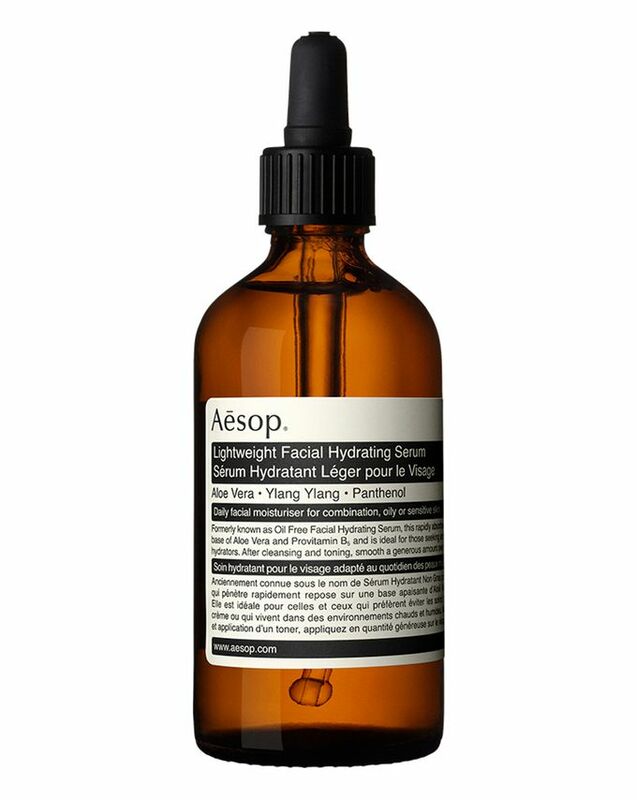 Aesop is ‘pro’ skin care for those who’re planning to grow older gracefully, proud of the skin that they live in. What's more, the bottles are truly iconic, instantly transforming any bathroom into the set of an 'at home with Vogue' shoot. Absolutely exquisite in every respect! Warm a few drops between the palms of your hands and smooth all over face and neck, allowing a few minutes for the serum to absorb before applying make up. Aloe Barbadensis Leaf Juice, PEG 60 Almond Glycerides, Sorbitol, PEG 150 Distearate, Camellia Sinensis Leaf Extract, Sodium Citrate, Panthenol, Cananga Odorata (Ylang) Flower Oil, Disodium EDTA, Magnesium Ascorbyl Phosphate, Phenoxyethanol, Methylchloroisothiazolinone and Methylisothiazolinone. I purchased the product out of curiosity, since I have oily/combination Skin and I was looking for something light-weight but still hydrating. First of all I do like the packaging and personally I think you do get quite a good amount of product for your Money. When I started using the product I was bothered by the unusual smell und aso the "stickyness" of the liquid. But after some time I actually come to like both of these features. The product needs about 5 min to sink into, leaving your Skin very soft. This product is not overly hydrating (so I think better to go with a different product if you require more Hydration) but for my skin type this works just perfect. I will definitely rebuy as soon as the product is back in stock. I got a sample of this serum with a recent purchase I made and it is fantastic! I have combination skin and have recently had a small break out, I used the serum and it really helped without leaving my skin dry and tight. I think it's a great base for make up and I will definitely be buying the full sized one. I bought this serum a year ago and I am still not sure whether I like it or not. I have sensitive acne prone skin. I keep using it and leaving it. I think it is because it doesn't do anything for me. I don't think it is very hydrating. Maybe it just did not work for my skin.